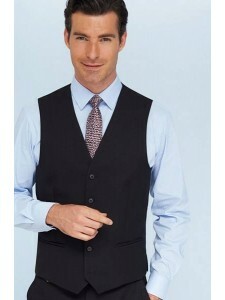 Short, 1 button jacket, Tailored fit, Slim lapel with seam detail, Centre vent.Colours AvailableA - .. Single breasted jacket, tailored fit, 2 button front, side vents.Colours AvailableA - NavyD - BlackS.. Dress 220g, 3/4 sleeve, round neck, flattering fit with waistline detail, stretch lining.Colours Ava..
Waistcoat, button front, 2 welt pockets, lining backed with adjusterColours AvailableA - NavyD - Bla..
5 button front, 2 welt pockets, lining backedColours AvailableA - NavyD - BlackSizesXS - XXLAfter Ca..
Straight skirt, centre vent, fully linedColours AvailableA - NavyD - BlackSizes4 - 26 Regular L..
Flat front trouser, tailored fit, key loop, 2 side pockets, 1 rear pocket.Colours AvailableA - NavyD..
Straight leg, slim waistband, with belt loops & key loop, 2 side pockets, mock rear pockets.&nbs..